George Clooney gets a second chance. A little over a week ago we met George Clooney. Our volunteers Ed and Gail were leaving the shelter to go home when they saw something moving in our front play yard. When they got closer, they found a dog who was literally skin and bones sniffing around the grass. Shelter Director Dr. Shayda Ahkami and our medical team joined Ed and Gail and brought the dog, now named Clooney, inside. 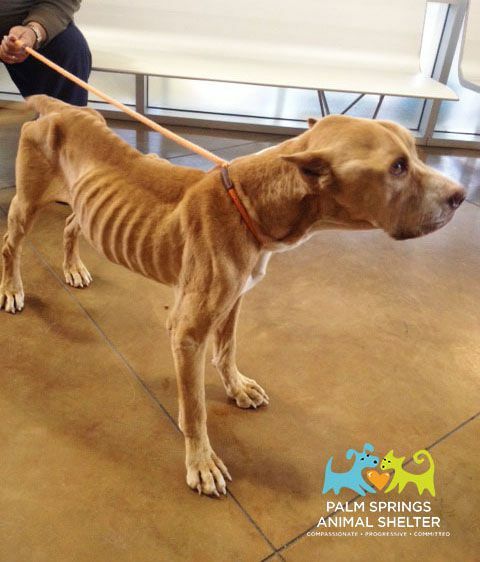 He weighted just 50 pounds, and when offered food and treats, he gobbled them up. He was ravenous, and despite his desperation, we could see his loving spirit when he would lift his head for a treat.Offering him food and treat, he gobbled them up. We don't know what Clooney's story was before he was abandoned here, but we do know that becoming this emaciated doesn't happen over night. 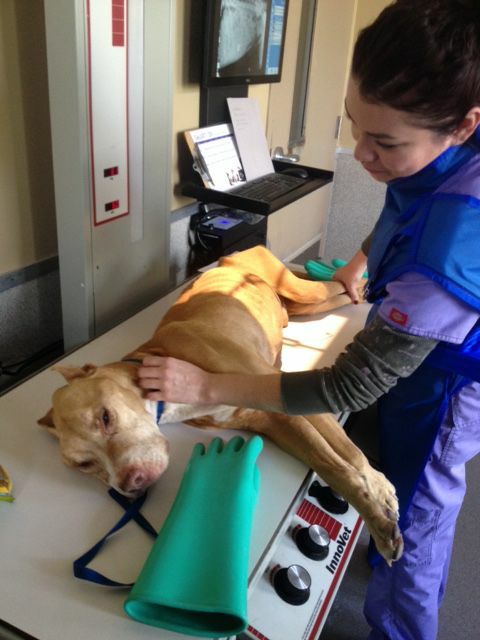 We are taking every precaution in monitoring his health, including x-rays, blood work and treating him for roundworm. Highlighting and sharing cases like Clooney's are difficult and affect us all in different ways. But we hope that the outrage and sadness that results from seeing these images, and reading his story, turns into action. Perhaps his story will inspire someone to report animal abuse, or bring an "outside" dog, inside. Since joining us at the shelter, Clooney has gained 7 pounds and is still under the watchful eye of Dr. Shayda. He has few fans who make sure he gets out for gentle walks every day, and we are anticipating the day when he is well enough for adoption. Friends of the Palm Springs Animal Shelter is dedicated to responsible pet stewardship and the humane treatment of animals, our mission is in action every day as the only public no-kill shelter in the Coachella Valley. Your support makes it possible for us give Clooney and the other animals in our care, a second chance. 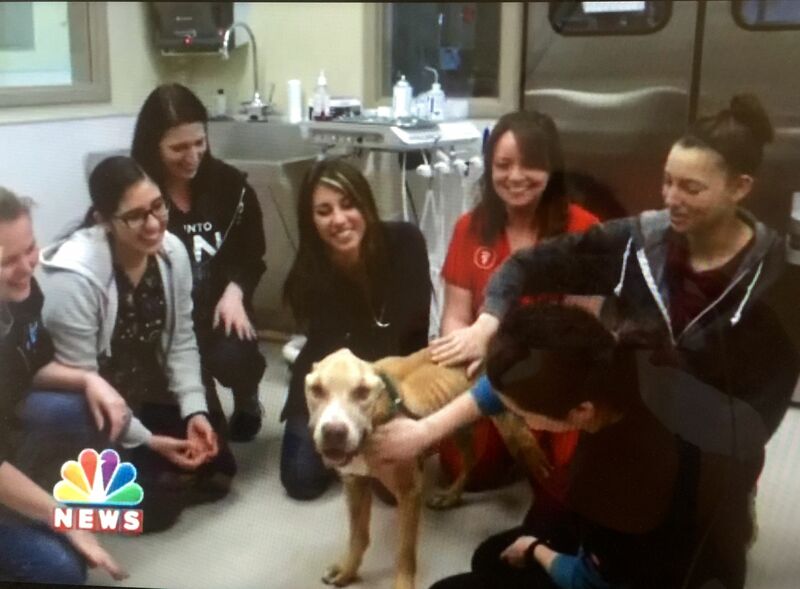 Many thanks to Kitty Alvarado of KMIR who gave Clooney a moment in the spotlight. If you missed the segment, you can see it here.